1 2 3 The Franklin Institute. Donors of the Medals and their histories. 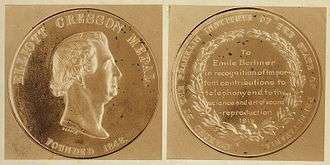 The Elliott Cresson Medal - Founded in 1848 - Gold Medal. Retrieved on July 13, 2009. Archived May 28, 2010, at the Wayback Machine. ↑ The Franklin Institute. Awards. About the Awards: History and Facts, Retrieved on July 13, 2009. ↑ The Franklin Institute. Winners. Cresson Medal winners. Note that the 269 listed awardees include two different entries for Lee DeForest, with different spellings of his name. DeForest received only one medal, in 1923. Retrieved on July 13, 2009. Archived February 1, 2009, at the Wayback Machine. ↑ Franklin Institute. Journal of the Franklin Institute, Pergamon Press, 1898, page 210. "The Econometer: A Gas Balance for Indicating Continuously the Proportion of Carbonic Acid Gas in the Flow of Furnace Gases"
↑ "Elmer Sperry Dies. Famous Inventor". New York Times. June 17, 1930. Retrieved 2012-12-21. In 1914, he was awarded first prize of the Aero Club of France or his airplane stabilizer; he also was the winner of two Franklin Institute Medals in 1914 and 1929; Collier Trophies, 1915, 1916; Holley Medal, 1927; John Fritz Medal, 1927; Albert Gary Medal, 1929; two decorations from the last Czar of Russia; two decorations from the Emperor of Japan, the Order of the Rising Sun and the Order of the Sacred Treasure; and the grand prize of the Panama Exposition.